Water down azure, for example, and you get blue and blueness. He was wearing an azure -blue polo-neck sweater and gray trousers. 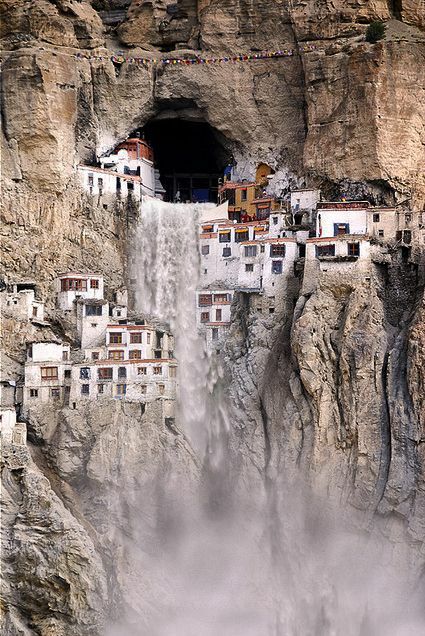 The Place: Phugtal Gompa, Ladakh, India. Tell me that picture doesn’t blow you away. That’s the Phugtal Gompa or the Phuktal Monastery in the remote Ladakh region. It was founded by Gangsem Sherap Sampo in the early 12th century, and the monastery is a unique construction built into the mountain side. From a distance it looks like a honeycomb of buildings on the cliffs. Home to about 70 monks, the monastery is located on the mouth of a cave on the cliff face of a lateral gorge of a major tributary of the Lungnak (Lingti-Tsarap) River. Isn’t that one incredible creature? I came to know about it, believe it or not, from the Disney Junior show “Octonauts” (which by the way is one heck of a show for kids that explores marine life while following the adventures of the anthromorphic crew of the Octopod). Siphonophores belong to the Cnidaria, a group of animals that includes the corals, anemones, and jellyfish. Although a siphonophore appears to be a single organism, each specimen is actually a colony composed of many individual animals. Most colonies are long, thin, transparent pelagic floaters. Each bulb in the photo above is an separate animal, each with different functions such as locomotion, capturing prey, waste removal, and reproduction. However, all these bulbs are descended from one fertilized egg. Hence all are genetically identical. 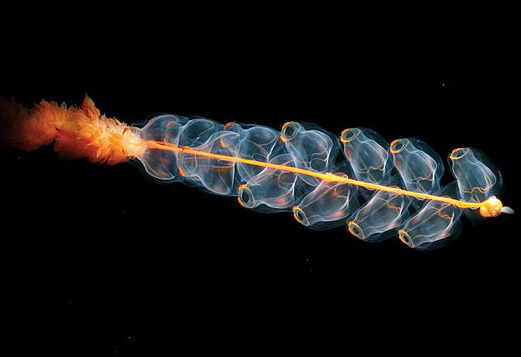 They prey on small animals using stinging cells that have stalks with glowing ends. The tips twitch back and forth, creating a twinkling lights to attract the small fish. A siphonophore of the genus Erenna is the second lifeform found to produce a red bioluminescence, the more common colors being blue and green. Siphonophores live so deep (half a mile below the surface), they are adapted to an incredible amount of pressure. When brought too close to the surface, their bodies burst because of the reduced pressure outside, making them difficult subjects to study. At a body length of 130-160 ft, they are among the longest animals in the world. Some, like the Portuguese man of war, are among the most venomous. You can read more about Siphonophorae here.